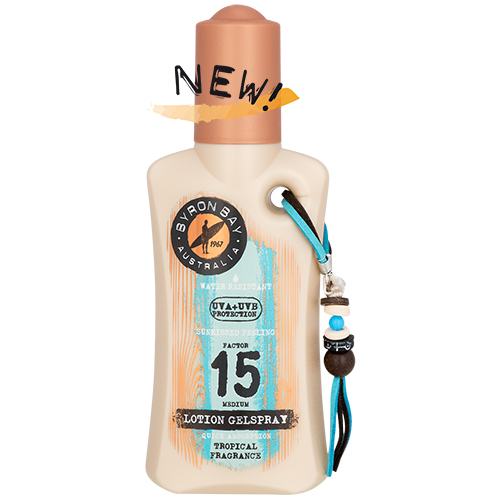 Byron Bay Lotion Gelspray SPF 15 protects your skin against the harmful UVA and UVB rays. The unique formula gives your skin a beautiful silky soft feeling and helps to prevent premature ageing caused by the sun. Besides that, the Lotion Gelspray has a delicious tropical fragrance and all bottles have a trendy look thanks to the charm with real shells and hand-made wooden beads. Ingredients: Aqua, C12-15 Alkyl Benzoate, Ethylhexyl Salicylate, Octocrylene, Butyl Methoxydibenzoylmethane, Alcohol Denat., Glycerin, Dimethicone, Dicaprylyl Carbonate, Parfum, Juglans Regia Seed Oil, Triacontanyl PVP, Glyceryl Stearate, Tocopheryl Acetate, Aloe Barbadensis Leaf Juice, Diethylhexyl Butamido Triazone, Ethylhexyl Triazone, Phenylbenzimidazole Sulfonic Acid, Microcrystalline Cellulose, Sodium Stearoyl Glutamate, Cetyl Alcohol, Caramel, Aminomethyl Propanol, Acrylates/C10-30 Alkyl Acrylate Crosspolymer, Xanthan Gum, Tetrasodium EDTA, Zea Mays Oil, Phenoxyethanol, Benzyl Alcohol, Piroctone Olamine, Cellulose Gum, Lecithin, Ascorbyl Palmitate, Tocopherol. Note: may contain traces of nuts.